KOKOMO, Ind. — The Indiana University Kokomo Art Gallery features the work of talented high school artists in its newest show. 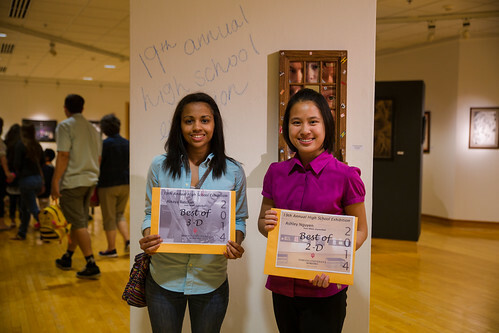 Aleaya Batchler of Peru High School and Ashley Nguyen of Taylor High School stand with their awards at the 19th Annual High School Art Exhibition. See more pictures on Flickr. The annual High School Art Show includes artwork created by juniors and seniors from Kokomo High School, Mississenewa High School, Peru High School, Tri-Central High School, and Western High School. The exhibition, which opened with an awards ceremony Wednesday, May 28, continues through June 14 in the gallery, in Upper Alumni Hall. Gallery Director Susan Skoczen encouraged people to visit and see the drawings, paintings, photography, ceramics, mixed media, and sculptures included in the show. "The level of work being created at the high school level is quite impressive, and we are honored to showcase this work," she said. "People should see this show to know how important art is in the curriculum, not just in high schools, but at all levels of education." Award winners included Ashley Nguyen, Taylor High School, best of 2D; Kaylee Anderson, Peru, best of mixed media and an honorable mention; Aleaya Batchler, Peru, best of 3D; and Cortney Zickmund, Tri-Central, juror's choice. Additional honorable mention winners were Karissa Bates, Peru; and Hadley DeWeese, Tri-Central. "The students in this show dedicated hours upon hours of time and effort into making these pieces," Skoczen said. "They do this because it is their passion and primary interest. It is evident in the high level of work in this show."